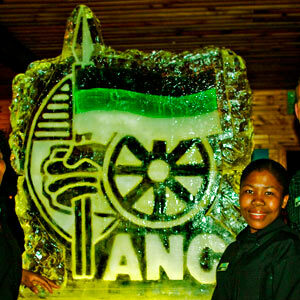 Ice Sculptures – Its black and white…. 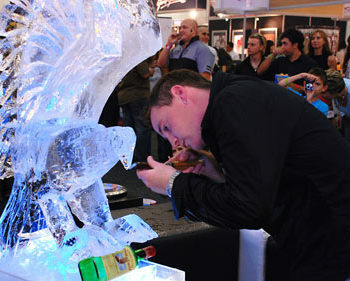 The ice blocks that we produce at Ice Art for the ice sculpture creations is crystal clear and its the only quality of ice black that can be professionally used for ice sculptures, ice bars and other ice constructions as it is inherently strong and has no structural weak points like normal cracked, white ice, or dirty ice as we call it in the ice carving industry. 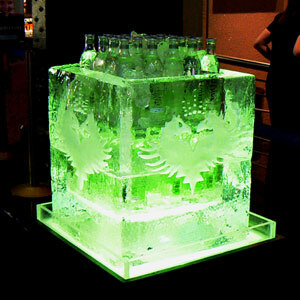 This process that produces clear blocks however, does not allow the ice to be coloured with a dye in the production process to produce a red, or green or black block… These dyes are seen as impurities and are extracted from the water by the machines drive to deliver clear ice blocks as a finished product. 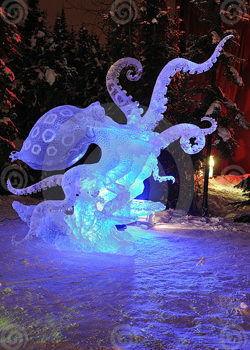 Colour can however be inlayed within the ice sculpture during the carving process. Black ice sculptures can be best expressed through the placing of a black background behind the ice sculpture, and then using snow engravings and a white light, one can highlight the detail and definitions of the sculpture to produce a very effective two tonal, high contrast result. 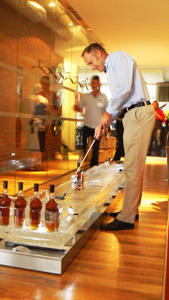 This approach is highly effective for shoots, such as pack shots where one can play with the lighting and angles. 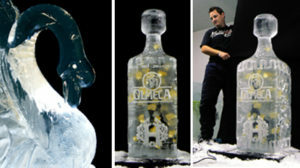 When using this approach for ice sculptures one needs to make use of both carving and form sculptural technique combined with the snow engraved areas, otherwise the ice sculpture outline can be lost on the black background. Flat snowfill engravings can stand alone without sculptural elements as they produce the contrast by virtue of the white snow.